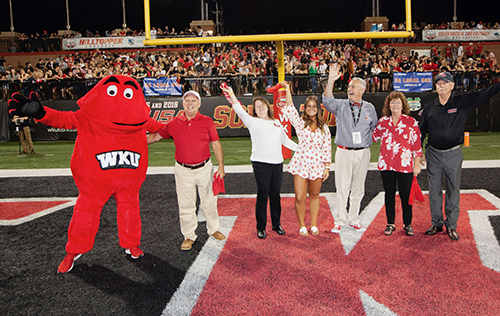 The family of WKU senior Stefani McCoy, a first-generation student from Elizabethtown, was recognized Saturday as WKU’s 2018 Family of the Year. McCoy, who will complete her Bachelor of Science in Nursing degree this fall, was joined by her mother, Juanita McCoy; her father, Steve Tabor; her aunt, Anita Sonner; and her uncle, Ronnie Sonner, during WKU’s Parent and Family Weekend activities. McCoy said her family members have been selfless in their support and encouragement during her journey to complete her nursing degree. “They each wanted to give me more of an opportunity than what they had at my age,” McCoy said. “They pushed me when I wanted to give up and when I made claims that college was too hard. Because of their actions and selflessness, I can help to make an impact on the lives of my patients, like my family has made an impact on mine." The WKU Forensics Team placed second in debate team sweepstakes and second in individual event team sweepstakes at the National Forensic Association national tournament.